What is your Christmas morning breakfast tradition? This is the first year we’ll enjoy the holiday in our own home in years and I’m excited to finally start a new tradition with my family. Cinnamon rolls are currently at the top of my list, as they will always be a favorite, but I wanted to put a holiday spin on the classic and dress them up a bit for the occasion. Inspired by a few cinnamon roll Christmas trees I’ve seen on Pinterest, I’ve made my own 100% homemade variation. This is just a basic cinnamon roll recipe and it’s our family’s favorite. The rolls are soft and sweet and perfectly gooey in the middle. I make them with Red Star Yeast so they’re always fluffy and light— exactly what you want in a cinnamon roll! 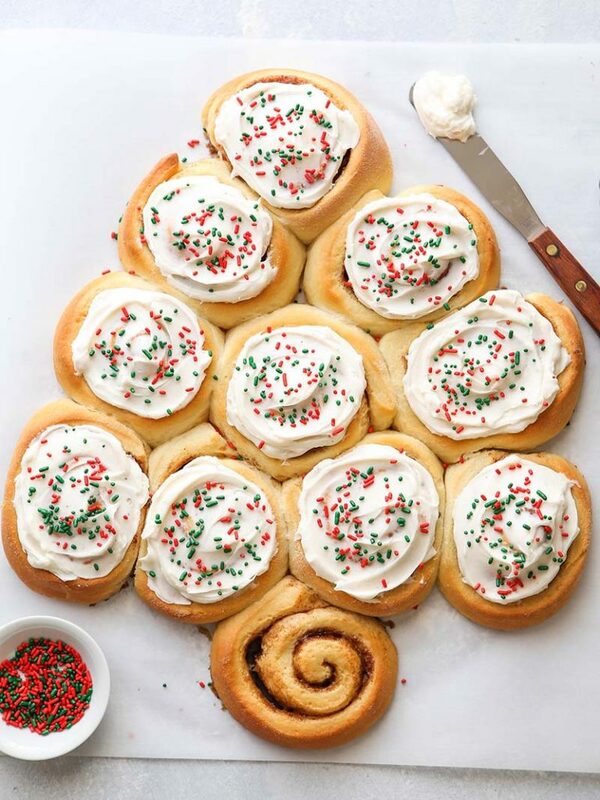 You can use whatever cinnamon roll recipe you like to make a Christmas tree shape, but if you don’t have a favorite recipe of your own, please feel free to make ours. Once they’ve baked, top them with cream cheese frosting (which I made with a little eggnog for more holiday flair) and some fun sprinkles. Both kids and adults will enjoy pulling the tree apart! Serve with coffee or hot chocolate and a side of bacon or sausage and you have a fun and festive breakfast fit for the season. 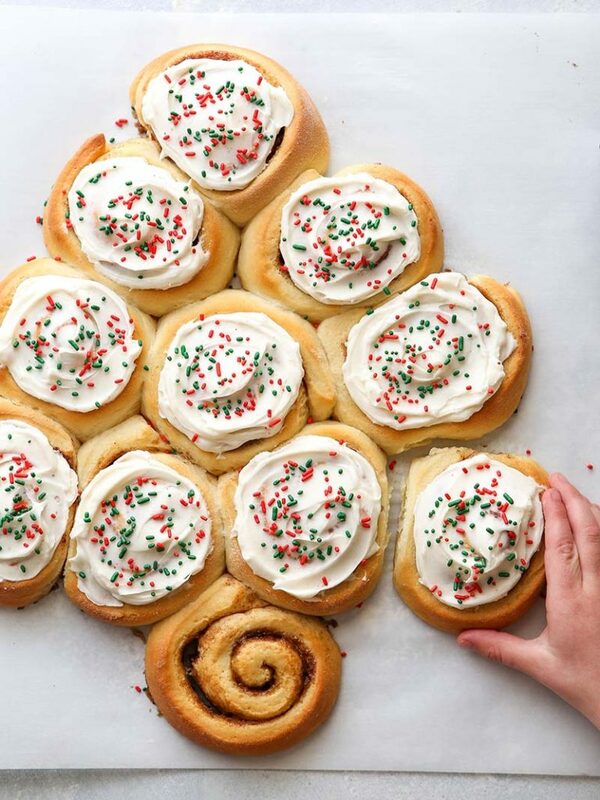 These fun and festive cinnamon rolls baked up in the shape of a Christmas tree are perfect for the holidays! Warm the butter and milk in a saucepan over medium low heat until butter is melted and reaches 120-130 °F. In the bowl of a stand mixer fitted with a dough hook, or in a large bowl if you plan to mix by hand, add 1½ cups of the flour, sugar, salt, and yeast. Add the warm butter mixture and egg and mix to make a wet dough. With the mixer running, add remaining flour, ¼ cup at a time, until dough mostly clears the bowl but still feels sticky. Knead the dough a few minutes more until smooth and elastic. Cover with plastic wrap and let rise in a warm place until doubled, about 1 hour. Gently punch down the dough to release gases and knead to bring back into a ball. Let sit for a few minutes while you get the filling ingredients ready. 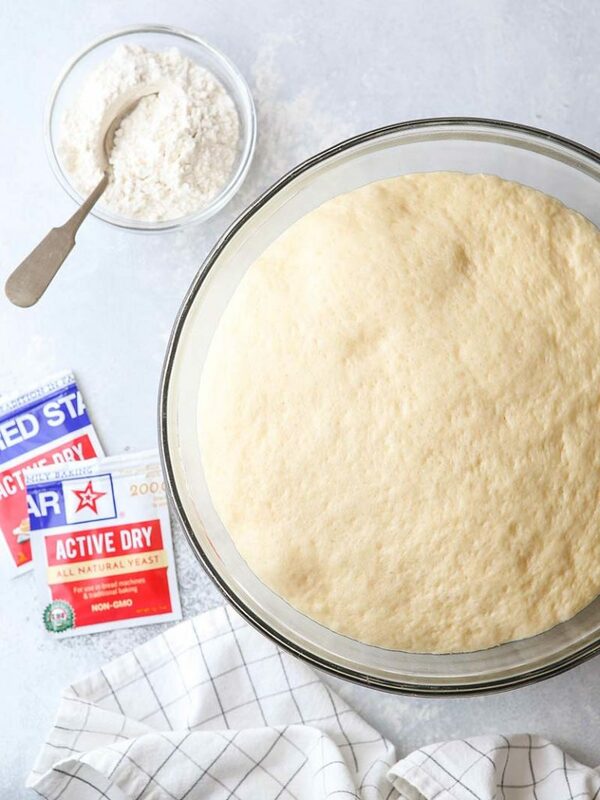 On a lightly floured surface, roll out the dough into a rectangle roughly 12x17-inches. No need to be exact. Spread melted butter evenly over the rolled dough. Sprinkle with brown sugar and ground cinnamon. Starting with one long end, gently roll up dough into a log. Using a sharp knife or unscented floss, remove ends to make a clean edge and cut into 11 rolls. Place on a sheet pan lined with parchment (see Notes) about 1½ - 2 inches apart to make a tree shape: 1 roll on top row, 2 rolls in next row, 3 rolls in next row, 4 rolls in next row, and 1 roll for the trunk at the bottom. Cover with plastic wrap and let rise in a warm place until doubled again, 20-30 minutes. Meanwhile, preheat oven to 350°F. Bake until cinnamon rolls are golden brown, 22-25 minutes. Make the frosting: In a bowl with an electric mixer, beat the butter, cream cheese, powdered sugar, and milk or eggnog until smooth and creamy. Add more milk or eggnog if needed to get a spreadable consistency. 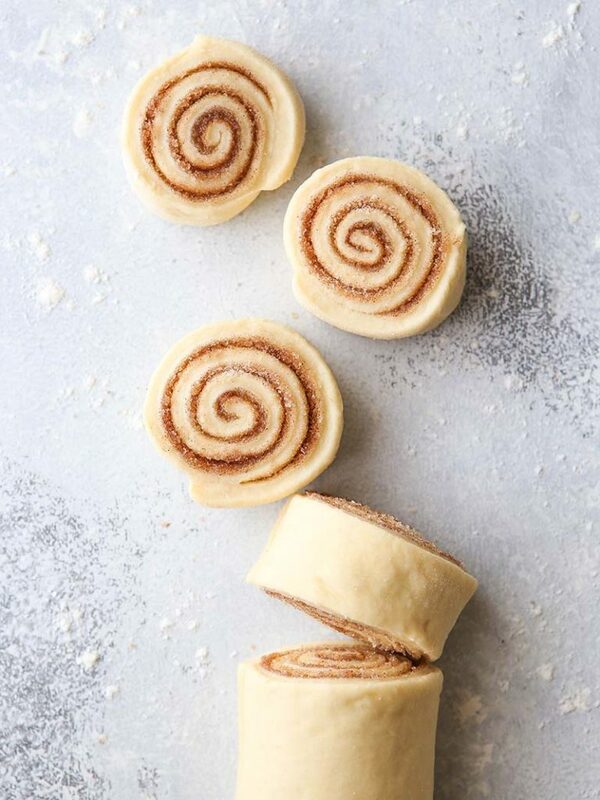 Spread frosting over warm or cooled rolls. Sprinkle with holiday sprinkles if desired. If you have a large rimless cookie sheet pan, that is ideal as the rolls will have more room and tree will keep its shape, but a rimmed sheet pan will work too (it's what I used). 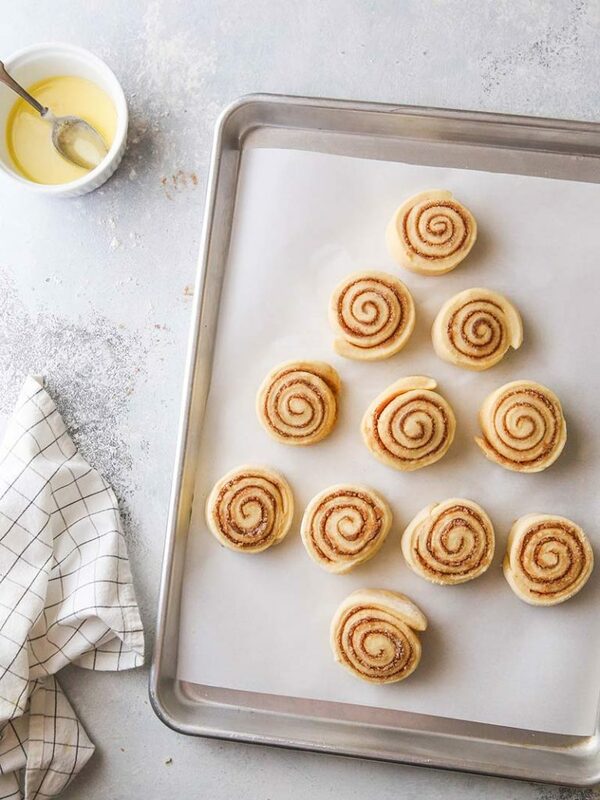 To make ahead: shape rolls and place on a sheet pan as directed. Cover with plastic wrap and chill in the fridge overnight. The next morning let come to room temperature while oven preheats, then bake as normal. Cinnamon rolls are best the day they are baked, but will keep at room temperature for a few days. Annalise is a self-taught baker-turned-blogger behind the site Completely Delicious. She stumbled on her passion for baking after college, attending culinary school briefly, before taking her quest for learning into her kitchen. She has an intense sweet tooth — on her blog you’ll find recipes for layered cakes, cookies, pies and more. 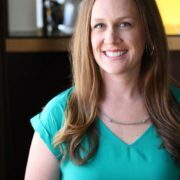 Additionally, she hopes to teach others what she’s learned through baking tips and tutorials. She currently calls Utah home, where she lives with her husband and two boys. LOOk so cute and good!